My ever-evolving wreath for 2018: it’s wild & free, like my heart. How are you feeling as we near the end of the year? The frenzied energy is well & truly upon us! For those like me, who feel… what’s the word… resistant? Yes, that’s what it is for me - resistant…we might feel inclined to retreat and search for solace at this time amidst all the busy-ness. That is what compelled me to write my new book Festive Season Reimagined - to find ways to reconnect with our inner strength, resilience and joy. That’s our intuition - it’s something we all have, something that no one or no thing can take from us: it’s our heart, our jewel, and I absolutely love supporting people in finding their heart and letting it take the lead in making their everyday decisions. It’s a way of life that is unique to you and when you are living it, you’ll know. It’s a wonderful feeling. Last week Diana Moore from Home Beautiful wrote a lovely post about Festive Season Reimagined, featuring an extract on the “ever-evolving wreath”. If you have signed up for my emails and instagram after reading the Home Beautiful post, welcome! I then posted on social media a photograph of my ever-evolving wreath for 2018. It took me only a few minutes to make, and it now adorns the front door. I asked if anyone would like a tutorial and the answer from many was yes. Then I realised what I’d said! One, I’m not great at tutorials because I work in such a free-flow way and two, it’s the end of the year and life is hectic enough! But it is so much fun to make these wreaths and it’s one of the most effective ways to connect to our intuition, the nature around us and embark on the journey of reflection, so here it is, my super simple tutorial which is just as much a tutorial on intuitive play than it is making the wreath. I’m a 3-stepper, which means whatever I create needs to fit into 3 easy steps because anything more I find we lose our intuitive connection. So, are you ready? The other part of the FINDING is to collect your botanical materials! Find something in abundance that can be the backdrop for your wreath. This year, I decided not to go with green as the backdrop and instead was inspired by a dried up patch of seeded grass in our neighbourhood, a place we have walked by hundreds of times this year, never thinking much of it until I began looking more closely at the flora along the walk to school and found the beauty in it. What can you see when you walk in your neighbourhood? So for the assembling, I gathered the grass into three bundles. I wanted to have an off-centre wreath, allowing the basket loop to be exposed, so 3 bundles is all I needed, but if your heart wants to have a full covered wreath then you just create more bundles! With the 3 bundles, I tied them onto the loop with string. No fancy floral wire required, just use what you have on hand. And don’t be too precious, perfect or neat. I find the quicker you work the better, otherwise you start to overthink it and criticise your work - if you realise you’re doing that, let those thoughts float away like clouds - there is no place for them here! Use the grass bundles as well as the string you’ve used to attach the bundles to the loop as your place of attaching the accent pieces - just stick those pieces into the string and thick grass, it will hold them in place and if it doesn’t, tie a bit more string around to hold it in place. You can keep adding foliage to cover the string until you are happy with it. For this step, you need to hang it up either in the place you want it to go, or just on the wall with some tape so you can step away and see it in place. When you step away, you’ll see some empty areas, or you’ll see where you need to tweak the foliage or add more foliage. As my main art medium is photography, I tend to ‘look’ through the lens so to speak, when I look at something I’ve just created - not literally, just in my mind… it’s an automatic thing for me from years of working in photography, but what might help for you is to put your hands up in front of you in the shape of a square camera lens, to allow you to block out all other distractions around the wreath and see it ‘through the lens’. You could also cut a square or rectangular piece of cardboard out of a larger piece of cardboard to act as your ‘review lens’. It might sound silly but it honestly works! It just helps you to focus on what you’ve created and not get caught up in what else is going on around. After I hung mine in place on the front door, we had a huge storm sweep through the area, but it held up well, there were a few bits loose but I just pushed them back into place. And I still add to it when I see something I like, that’s why I call it ever-evolving, because it’s something you can continue to play with over the season. I’ve posted more about the making of this wreath in my stories on instagram if you’d like to check it out, my handle is @piajanebijkerk, here it is. In book news, Festive Season Reimagined sold out of its first print run in less than a month! A huge thank you to everyone who purchased a copy last month. I’ve ordered the second print run which will be ready in the next week or so, for those who are patiently waiting with your orders, thank you! And if you’d like to purchase a copy, please click here for all the details. 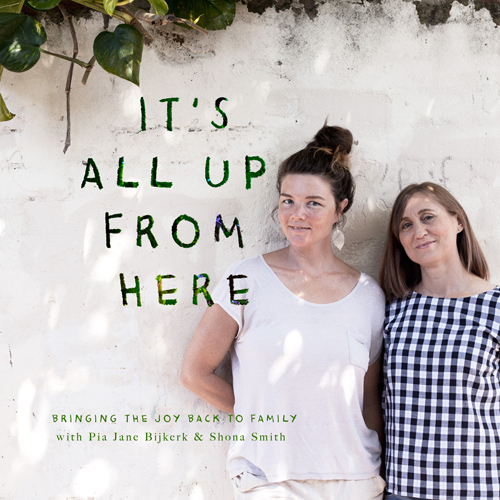 Reflection is a BIG part of growth at this time of year, and I’m delighted to let you know that Shona Smith - my fabulous podcasting pal & I have released a bonus episode for our podcast “It’s All Up From Here”: it’s all about how to reflect on your parenting. It’s a fun, thoughtful, raw & honest episode, I hope you enjoy it, click here and scroll down to the end to have a listen. You’ll also find our last episode of the season there, all about Christmas or as I call it, the Festive Season. Shona and I couldn’t be more opposite in our feelings about this time of year, so if you feel like a laugh, have a listen! And tomorrow, I have another wonderful announcement that is also for your listening pleasure, to get you well and truly inspired to reflect. And on Patreon, I have uploaded the next piano composition, with another one coming in a couple of weeks - when you join me there, you are able to download all the songs for the year so far to create a playlist designed to connect you to your intuitive heart space, and learn more behind the scenes of what I’m working on and where I am on my personal journeying.